Hong Kong Supermarket is an Asian American supermarket chain started in the San Gabriel Valley region of Southern California. It operates mainly in the newer suburban overseas Chinese communities, particularly in the Los Angeles, Philadelphia, and New York City areas. Hong Kong Supermarket specializes mainly in imported Asian groceries. Many items are from China, Hong Kong, Macau, Japan, South Korea, Thailand, Taiwan, Vietnam, Indonesia, and the Philippines. The supermarket caters to a specific customer base. The store in Monterey Park, California, is a popular destination for Mainland Chinese emigres, and the Hong Kong Supermarkets in New York City focus on Mainland Chinese immigrant customers (large community of mainlanders in Brooklyn). 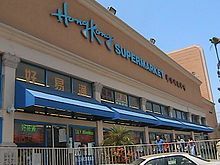 Hong Kong Supermarket was established in 1981 by Jeffrey Wu with its flagship store located in Monterey Park, California, where it is still among the popular Asian supermarkets, and is headquartered in New York City. It is currently owned by Jeffrey Wu and Veronica Yip. In Southern California, its main competitors are 99 Ranch Market and Shun Fat Supermarket. In the New York City area, it competes with Kam Man Food, Good Fortune Supermarket, New York Mart, and Great Wall Supermarket. In Boston, it competes with Kam Man, H Mart, and C-Mart. In 2009, Hong Kong purchased Super 88, an Asian supermarket chain which had already closed three of its six stores in 2008, citing poor sales. Super 88 had also faced increasing competition and a $200,000 settlement after violating state wage and hour laws. The chain of supermarkets is owned by businessman Jeffrey Wu (胡兆明) and his wife, former Hong Kong actress Veronica Yip. The chain sold much of its stores to the Good Fortune Supermarket chain. ^ "Super 88 Closes Three Stores". 2008-10-13. Retrieved 2012-10-21. ^ Megan Woolhouse (2012-08-27). "Super 88 grocers being sold". Boston Globe. Retrieved 2012-10-21. This page was last edited on 13 September 2018, at 01:34 (UTC).